You may often need to to display reports & dashboards on Large TV screens, for a live view of important metrics and trends. 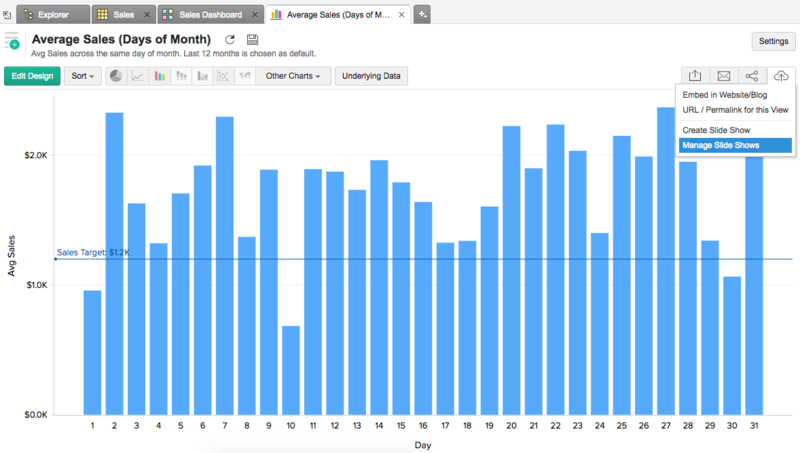 Zoho Analytics allows you to do this by publishing the views in your database as a slide show. You can embed as well as create a permalink for the slide show (to access it standalone) as needed. This option is only available in the paid plans of Zoho Analytics. To learn how to subscribe to a paid plan, click here. 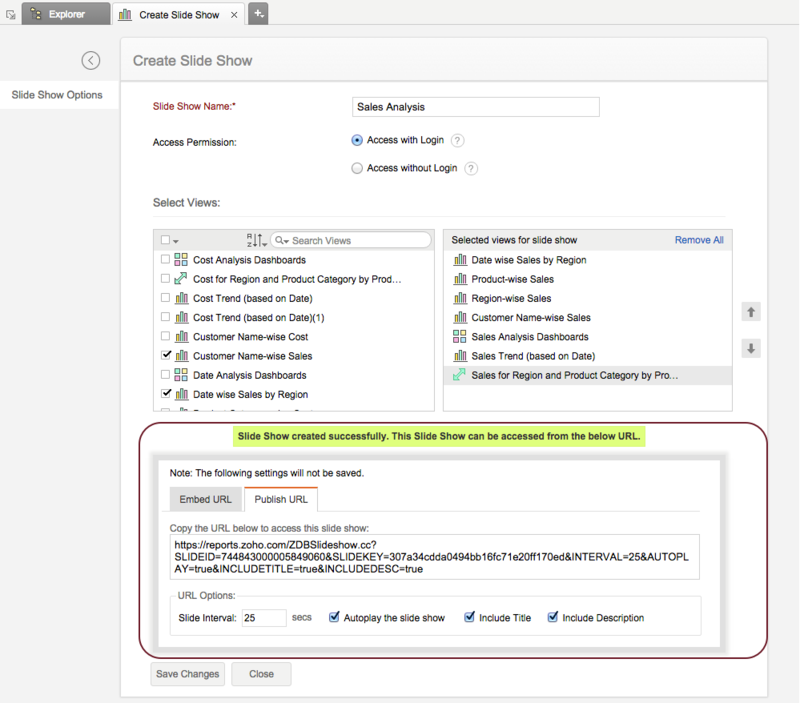 You can easily create a slideshow of your views in Zoho Analytics by following the steps given below. Open any report in your Workspace. Click publish icon and then select Create Slide Show. The following screen will open. Specify a name for the slide show. Specify whether the slide show should be accessed with or with out the login. Select the views to be part of the slide show from the list field. The selected views will be listed in the field in the right. 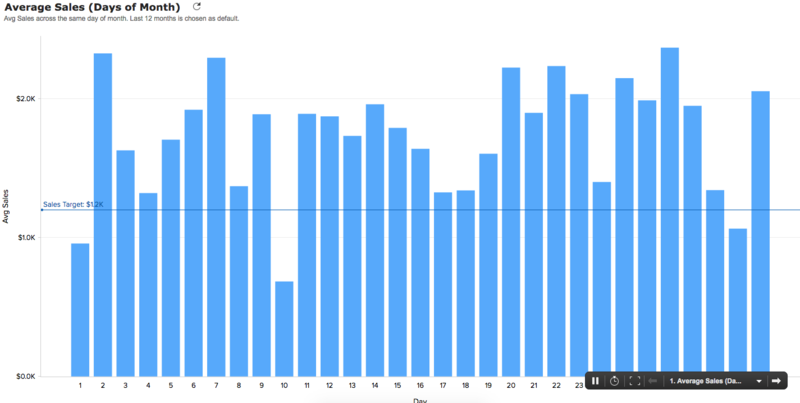 You can arrange the views in the desired order using the arrows. Click Create Slide Show. The slide show will be created and the embed URL and Permalink will be displayed as shown below. You can specify whether the show need to be auto played using the option Autoplay the slide show. This will be selected by default. You can set the Slide interval, which mentions the duration between slide transitions. Select Include Title and Include Description to add title and description in the slide show. For Embed URL specify the Width and Height of the show. Access the URL in a browser. This will open as shown in the illustration below. On mouse over a toolbar will appear with options to play/pause, change slide interval, set to full screen, and navigate to previous, next or specific view in the list. You can display the slide show on Large TV screens by setting this to full-screen mode. You can do this either using the option in the slide show toolbar or by using the standard full-screen short keys as follow. 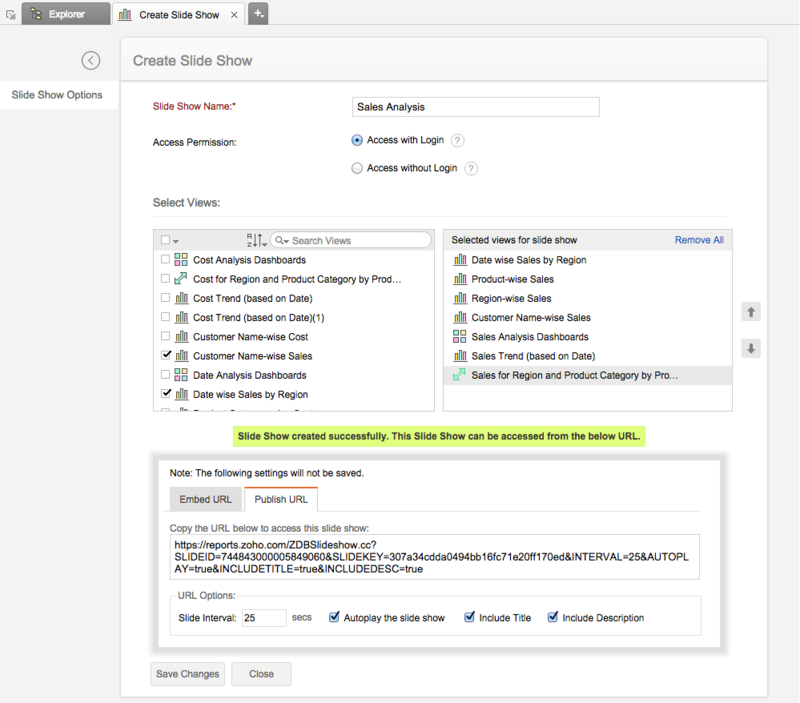 Zoho Analytics provides options to edit or delete the slide shows at any time in the Manage Slide Show page. Click the Publish icon and then select Manage Slide Shows. In the Manage slideshows page that opens, click the Embed icon to get the URL of the slide show already created. Click the Edit icon to edit the slide show contents. Click Delete icon to delete a slide show.